If you’re looking for an issue tracking or task management tool, it can be hard to know where to start. There are so many tools available! Trust me, Axosoft has been building project management and bug tracking software since 2002, and we’ve seen it all. After nearly two decades of lessons learned, we think we’ve figured out what sets the best productivity tools apart from the rest. One of the biggest insights we’ve gained is that you can’t be everything for everyone. Feature creep is all too real, and instead of making your tool more valuable for more people, it can quickly become less useful for everyone. You need to decide who you’re building your tool for, what their pain points are, and then figure out how to make their lives easier. Our mission has never wavered: we’re focused on creating software that helps developers be more productive. So, at the core, GitKraken Glo is designed for developers and the teams who work with them. To quickly show you how GitKraken Glo Boards stands out from competitors, I’m going to compare it to a well-known task tracking tool: Trello. I’ll show you 10 ways we designed Glo specifically with devs in mind, and by the end of this article, I bet you’ll be ready to starting using Glo instead of Trello—or whatever other issue tracking system you’re using today. Watch this comparison video of GitKraken Glo Boards vs Trello; or keep reading! A big part of increasing productivity is getting things done quickly. When you’re trying to move fast, you don’t want to have to jump around to multiple screens to get the relevant information you need. This is where a major UI difference between Glo and Trello comes into play. Trello opens a modal and locks your screen when you click to view a card. It may not sound like a fatal flaw, but it’s frustrating in those moments when you just want to browse a bunch of cards, you clicked the wrong card or you just want to double check another card before you make an edit. The Glo UI was very intentionally designed with the details panel on the right-hand side of the screen to provide a non-intrusive way to view more information. It updates instantly when you click another card, and keyboard shortcuts like J and K (for you Vim lovers) can be used to select other cards. While it’s important to have everything you need in one view, it also means you need to be able to quickly filter out what you don’t need to see! With Trello’s search, you type your search string first, and then hit enter to review results. If you want to use card filters, you’ll find them buried in the menu. Alternatively in Glo, you just start typing and your search results update with each additional character, and card filters work right there in your search bar! With features like these, you’ll undoubtedly find what you’re looking for faster in Glo than in Trello. ProTip: Type @username to filter items assigned to a specific user, #labelname to filter by a specific label, and due:[date filters] to filter by when items are due. When it comes to managing your tasks, you’ll want to know what’s assigned to you specifically. In Trello, when you click a user icon, it opens a modal to view that user’s activity and a few other things (see screenshot below). Alternatively, when you click a user icon in Glo, it will filter your board to show only cards assigned to the selected user. And because cards can be assigned to multiple people, you can click multiple nodes to see items assigned to a duo or team. Most devs are very accustomed to using a calendar to see what upcoming tasks are scheduled for the day, week and so on; it’s pretty helpful for planning out your time. If you want a calendar view in Trello, you’ll need to first apply the Calendar Power-Up to your account. If you’re already using your one free Power-Up, you’ll be prompted to upgrade to Trello Business Class: a paid plan. Womp womp. In Glo, there’s a free, built-in calendar view. Just click the calendar icon to see tasks with upcoming due dates. Ta-da! You’ll see labels at a glance and can click cards to view more info (in that handy dandy details panel I mentioned earlier). In Glo, by default, the left panel shows a list of cards that have no due dates, which makes it easy to identify cards that need a due date. Just drag and drop to assign when they are due. Drag and drop a card from one day to another to update the due date. Even click any day on the calendar to add a new card that’s due on that day. You’ve probably picked up on this by now: Trello comes in basic blue. With Glo, you have options! Glo has both a dark theme, Glo theme, and if you’re not ready to come over to the dark side—yet—we have a light theme, too. There are 31 million developers in the GitHub community who collaborate on code together; that’s a lot of tasks! GitHub Issues are what many of these developers use to track tasks, bugs and features. So, it makes sense for your task tracker to be able to pull in these items for you. Trello doesn’t officially support GitHub Issue Sync. Alternatively, Glo provides a sleek integration, and just like the Calendar View, it’s included for free! When you sync a Glo board with GitHub Issues, you’re able to visualize the progress of GitHub Issues through your workflow. You can create different workflows and labels for each board, and add different users and security permissions. And because Glo Boards sync in real-time with GitHub Issues, changes made in either system are immediately reflected in the other. Meaning, if some team members are using either Glo or GitHub exclusively, important information is still shared seamlessly—and lightning fast! Less context switching is super important for developer productivity. Trello doesn’t offer Atom or VSCode plugins. Since our focus is on developers, we have prioritized easy access to Glo from the start. Glo can be accessed directly in the GitKraken Git Client, through a browser, or using Atom or VSCode plugins. This is a game changer for productivity because developers can access their items in the tools they are already using! Simply make an update to your project and then move or update your Glo card. GitKraken lets you link a Glo board to your current repo. Again, reducing the amount of time wasted clicking around and switching tools. With one click of the Glo button in the GitKraken Git Client, you’re always taken to your project’s Glo board. ProTip: Use this handy feature if you typically commit and push before updating a Glo card. Trello does not offer a comparable feature. At the end of the day, it really comes down to the way you work, and which tool supports your needs. We saw an opportunity to do task tracking differently for developers because tools like Trello weren’t cutting it. While feature parity may change, we will continue to use our expertise to find ways to make the workflow of developers faster and more productive. 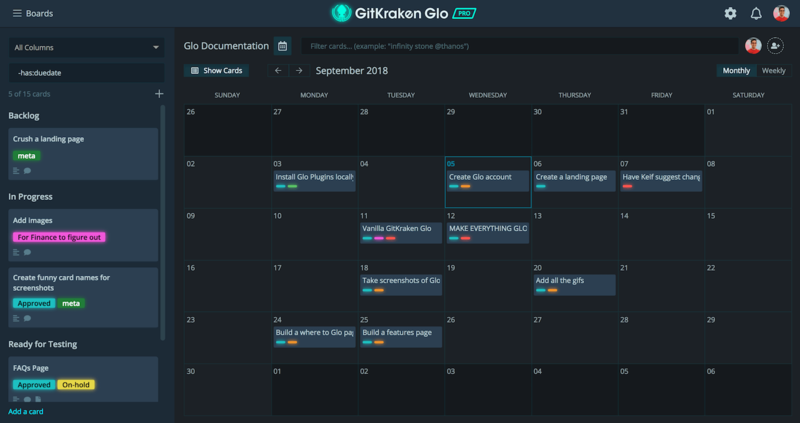 You should put GitKraken Glo Boards to the test, and find out how much more efficiently you can get work done; it’s free to try all the features! #GitGloing with GitKraken Glo Boards for free!